Cyclopses act as artillery units - installed to protect key points with devastating mortar fire, though some evidence suggested that the Cyclops was in fact an enormous sensor or beacon, and that its defensive capabilities erewsecondary. This was disproven during the Infinite Forest crisis with the instance of Dendron, Root Mind - an Axis Mind who appeared in the form of a Cyclops. 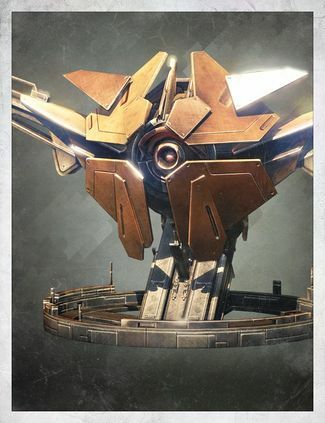 A Cyclops fires large mortar rounds that deal very high damage Guardians in their blast radius, and are capable of tanking numerous attacks, making them a dangerous priority target when present. However, when damaged, a Cyclops will enter a confused state, firing Torch Hammer bolts wildly and without focus. This can result in friendly fire on the part of the Cyclops. These units can be found in The Nexus and Echo Chamber Strikes; in the latter a group of three guards the final Arc-based barrier. They are also present in the Black Garden of Mars and occasionally the Ishtar Cliffs of Venus. Cyclopes can also be found on Mercury and Nessus. In Destiny 2, they gain armor plating surrounding their eye region, protecting them from damage unless struck in their eye. Viewed from above or below, the base disk of a Cyclops strongly resembles a "peace" symbol. Cyclopes are one of the only two Vex who have unique Radiolaria placements, located on its abdomen. Front view of the Cyclops. Back view of the Cyclops.